From an early age Lewis Hamilton attracted attention as a potential F1 champion and as he grew older he did not disappoint. Equipped with an assured racing style which belied his years, Hamilton rose rapidly through the ranks, a rise which culminated in becoming the sport's youngest world champion in 2008. Hamilton has polarised opinion during his time in F1, but he is undoubtedly one of a dying breed of thoroughbred racers and capable of collecting even more titles in the coming years. Hamilton took his first steps towards F1 in 1993, aged eight, when he started karting at Rye House Circuit in his home county of Hertfordshire. By ten he was British Champion and on collecting his award at the Autosport Awards Ceremony, he approached McLaren team boss Ron Dennis and told him, "I want to race for you one day." Dennis wrote in Hamilton's autograph book that he should "give him a call in nine years". Less than three years later Dennis signed Hamilton to the McLaren Mercedes Young Driver Support Programme with the intention of developing him into the ultimate racing driver. The McLaren funding enabled Hamilton to progress to single-seaters via the Formula Renault series in 2002 -- a championship he won in his second year with two rounds remaining. In 2004 he moved up to the Formula 3 Euroseries and in his second season took a dominant win. He followed it up by winning the GP2 series at his first attempt in 2006 with Nelson Piquet Jr as his only real opposition. After the departure of Kimi Raikkonen to Ferrari and Juan Pablo Montoya to NASCAR, McLaren found themselves requiring two drivers for the 2007 season. In November the news came that the racing fraternity had long been expecting -- Hamilton would drive for McLaren in 2007 alongside Spaniard Fernando Alonso. Although stunning, Hamilton's first season in Formula One was not without drama. He regularly outperformed reigning world champion Alonso, standing on the podium after each of the first nine races. He scored his first race win in Canada, and followed it up one week later with his second at the US Grand Prix. 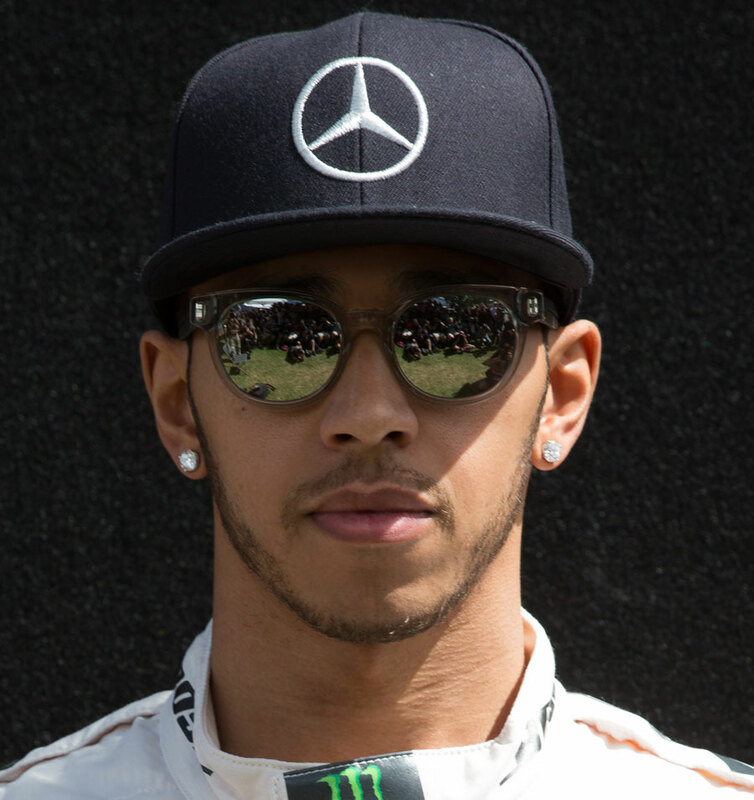 Leading the championship, Hamilton was now being billed to do the unthinkable and win the world title at his first attempt. With Alonso heading back to Renault for the 2008 season, harmony was restored at McLaren. Once more the season went to a final-race decider in Brazil and this time Hamilton arrived with a seven-point advantage and needed to finish in the top five to win the title. As rival Felipe Massa crossed the line to win the race Hamilton was sixth, but moments later he put in a last-gasp move on Timo Glock -- who was struggling on the wrong tyres -- to finish fifth and take the title by a single point. If his first two seasons in F1 had been a dream come true for Hamilton, the third could be seen as a nightmare. He only managed to score nine points by the tenth round of the season but aero upgrades to the underperforming McLaren for the German Grand Prix showed promise and he took two wins and two podiums in the second half of the season. Contracted at McLaren until the end of 2012, Hamilton was linked to a move away during 2011 but insisted he saw his future with the team. However, after another season in which McLaren was unable to challenge for the championship, Hamilton's patience appeared to be running out. 2012 started in promising fashion with two pole positions and three consecutive podiums, but slowly the pace-setting McLaren was overhauled and mid-season cracks started to appear. Following secret talks with three-time champion and Mercedes chairman Niki Lauda over the Singapore Grand Prix weekend, it was announced in September that Hamilton would join Mercedes for the 2013 season. Pre-season testing was encouraging and even though Hamilton tried to temper expectations, he secured a podium in just his second race for the team as Mercedes emerged as the biggest threat to defending champions Red Bull. His first pole came in just the third race in China, but the car struggled on its tyres in the race. With Mercedes stealing a march over the rest of the pack at the advent of F1's new turbo-hybrid era in 2014, Hamilton was handed a car capable of matching his talent. A tense battle with his teammate and former karting rival Nico Rosberg followed, quickly souring the relationship between the two drivers. Hamilton came off worse in a clash of wheels at the Belgian Grand Prix, but recovered with a series of inspired drives to secure the title in Abu Dhabi with his 11th win of the season. In 2015 he had the upper-hand over Rosberg from the start and cruised to a third world title with three rounds remaining. A three-year contract extension starting in 2016 saw him committed to Mercedes but over the course of the season Rosberg came out on top. Hamilton was eager for a rematch, but before the end of 2016 Rosberg retired from F1 with a shock announcement ahead of the FIA's prize giving. Paired with Valtteri Bottas in 2017, Hamilton's main opposition came from Sebastian Vettel at Ferrari. After a tense battle throughout the year, Hamilton emerged on top to take the fourth title of his career and his third with Mercedes. Hamilton's driving style has always ensured he stands out from the crowd, with the confidence to attempt overtaking manoeuvres his rivals wouldn't even consider. He has matured in recent years and now rarely makes mistakes when the pressure is on. His dominant 2014 season in which he showed the maturity which had been lacking from previous campaigns. He took 11 victories en route to his second world championship. Hamilton is the proud owner of three Blue Peter [a British childrens' TV show] badges -- he received his first aged six when he appeared on the programme to drive remote control cars, his second and third aged 12 and 16 for karting. Won the BBC's Sports Personality of the Year award in 2014 following his second world championship, having missed out on the accolade in 2007 and 2008.